It is the Seventeenth of May! Syttenda Mai! Or the Norwegian National Day. It is a day of spontaneous celebration by children everywhere in Norway. This is a really big deal here, a bit like fourth of July for us, but more of a celebration of the goodness of life and the joy of being a unified country. This day is adopted to celebrate the liberation at the end of WWII though it has historically been celebrated before this (see Wikipedia!) Every elementary school district has their own parade with colors and music and festivities. In Oslo, nearly 100,000 people march together on this day. Here the local district is from Halsa, a small town across the fjord. 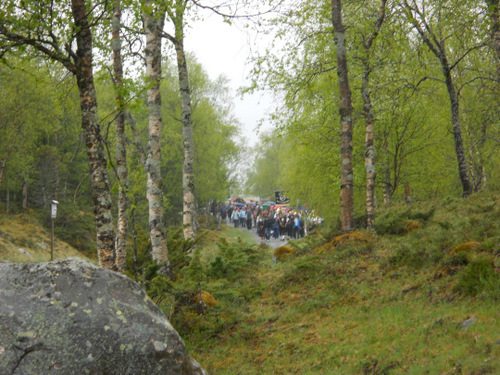 The kids gather and take the ferry across the fjord and celebrate with a parade down the dirt road leading to the tourist house. 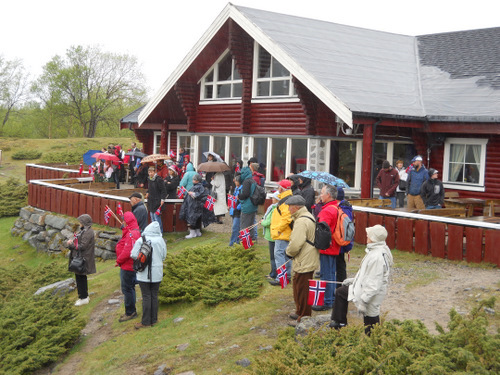 They pass right by our cabin waving red blue and white ribbons, dressed in traditional costumes, playing music, making lots of noise and spontaneously shouting . .. Hurra! 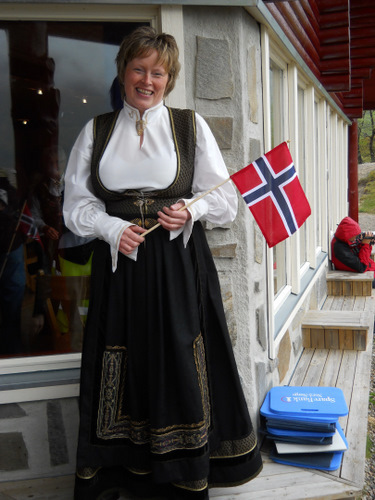 It is a day for Norwegians to be proud of their country. I am thrilled that I had a chance to see it on my last day here. 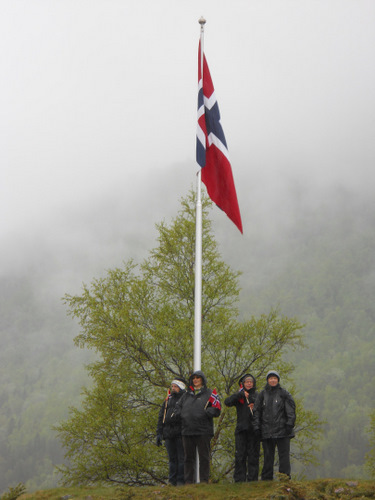 A few proud Norwegians gather about the flag and cheer. The parade approaches with a bus driving behind the group. You can hear all the hooplah and fun from far away. It is a bit surreal to be in a quiet valley and watch this joy pass by. 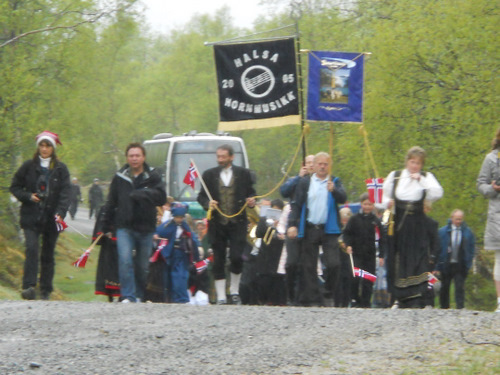 The banner from Halsa adorns the front of the parade, there is a lot of music! 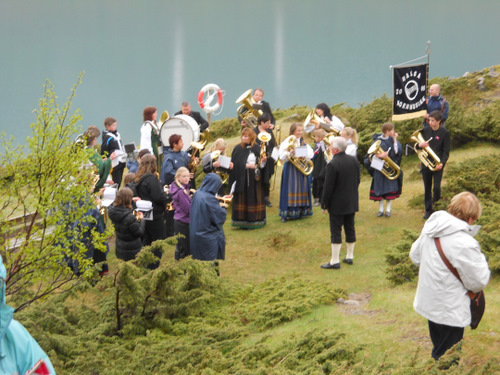 The Halsa band plays some classical songs. Oddly, they were tunes I knew as English ones. It is a typical day for Norway, rainy and wet. Everyone is quite happy watching the band play. The owner of the tourist house, (not really sure of her title), invites everyone in for coffee and cake. She is very kind and welcoming. 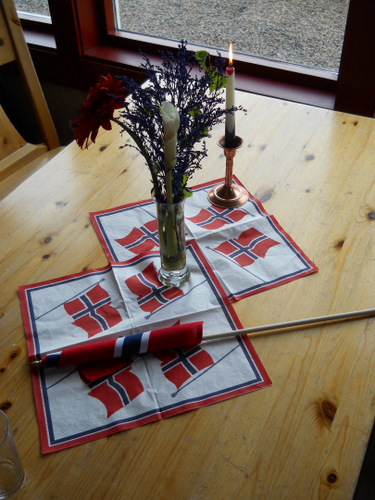 Inside the house it is warm and cheery, everything is decked out in Norwegian colors and flags. 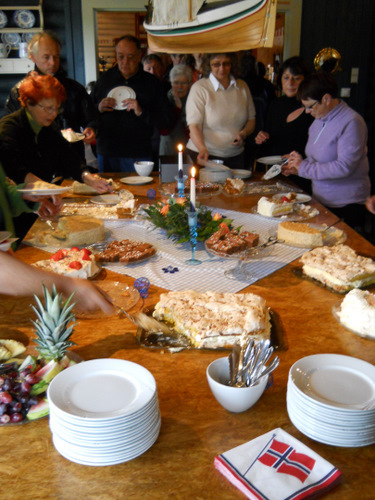 We are invited to have cake and coffee, the community is very kind to us. Syttende Mai.